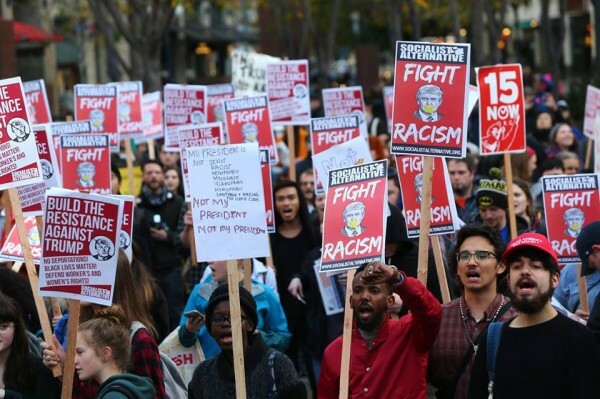 ANTI-TRUMP PROTESTS: IN LESS THAN 24 HOURS 40,000 PEOPLE ANSWERED OUR CALL! The unthinkable has happened – Donald Trump has won. Further, the Republicans have seized control of both chambers of congress. They are planning to unleash a storm of attacks against the most vulnerable in our society. This cannot stand. We need to stand as one and revive the solidarity in the old labor slogan, “an injury to one, is an injury all.” We need to build the fightback to Trump and the Right. But to challenge Trump’s agenda, we need your help. We need the millions of people who stood for Bernie’s political revolution to join in building an independent grassroots movement that can stand against fierce attacks from Trump and the Right. We need to raise $10,000 in the next week to begin building for the Trump inauguration protests being planned across the country. Please contribute $25, $50, or $100 today!